So what’s your preferred graphite diameter for mechanical pencils? Are you a 1.1 or 0.9 or 0.7 or 0.5 or 0.3 mm kind of person? Me, I am typically a 0.7 mm person. For most cases, 0.9 mm and larger feels too fat. On the other end, diameters smaller than 0.7 mm feel like they could break at any moment. At least that is how I felt about thin graphite until I came across the Zebra DelGuard 0.5. By pairing the Zebra DelGuard’s unique break-prevention clutch with 0.5 mm graphite in F grade, I am enjoying a thinner diameter pencil without the constant worry and annoyance of snapping graphite. 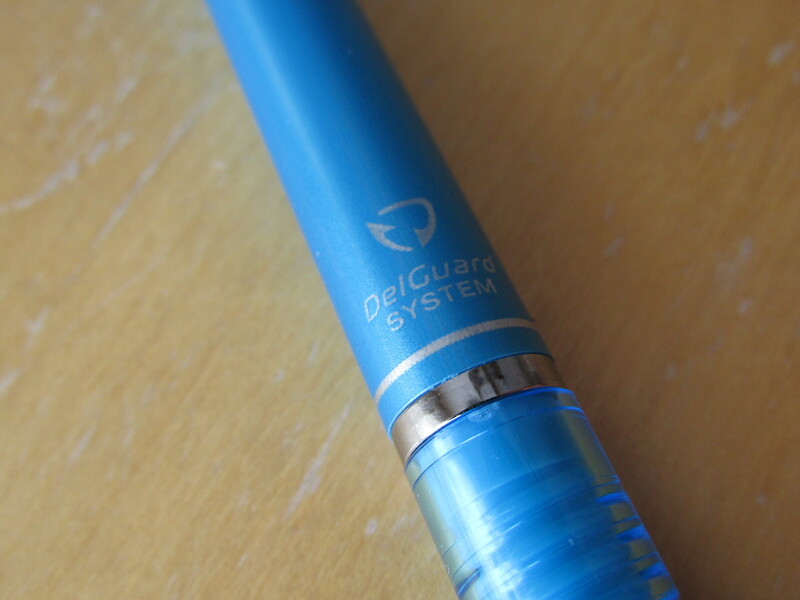 The DelGuard comes in a variety of colors. I opted for the light blue option but I am so impressed with this pencil that I fully expect the light green version will find its way to my doorstep soon. The overall body of the pencil is slightly tapered as you go from the wider eraser end to the thinner grip section. This tapered shape and the subtle, smooth ridges of the grip section offer plenty of hold and control. The overall length and balance of the pencil works very well in my small/medium hand. The grip section has a small transparent window that shows off the top of the patented DelGuard clutch system. You cannot see too much through the window, but you can see a spring and a bit of mechanical action when pressing the knock giving the pencil a cool…well…mechanical vibe. On the one end, I was, initially, put off by the appearance of the funnel-like post whence the graphite extends. Then I realized, I’m a chemist and I love funnels! Also, the funnel shape completes the overall tapering of the pencil body and gives you a clear visual of the extended graphite. On the other end, the knock cap covers a slightly-better-than-worthless eraser. 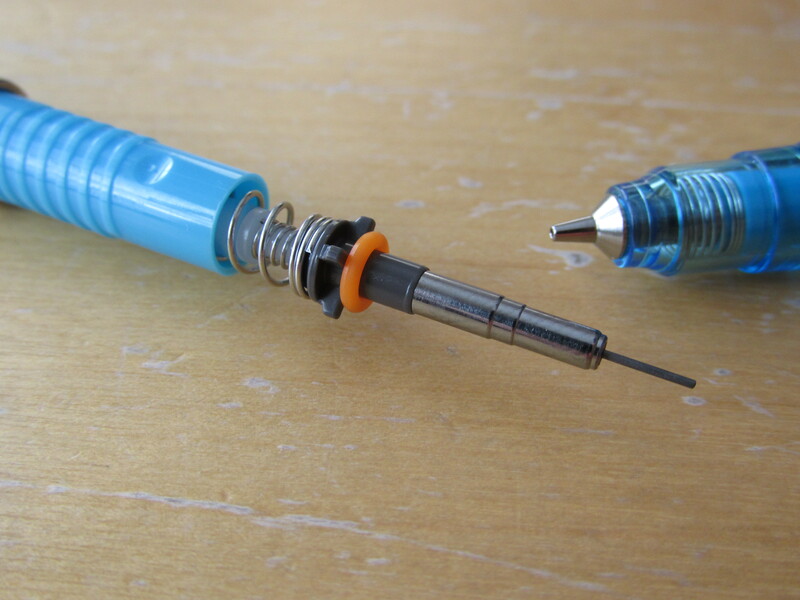 In the pantheon of mechanical pencil erasers, I would size up the one installed on the DelGuard as a small-medium bit of erasing plastic. 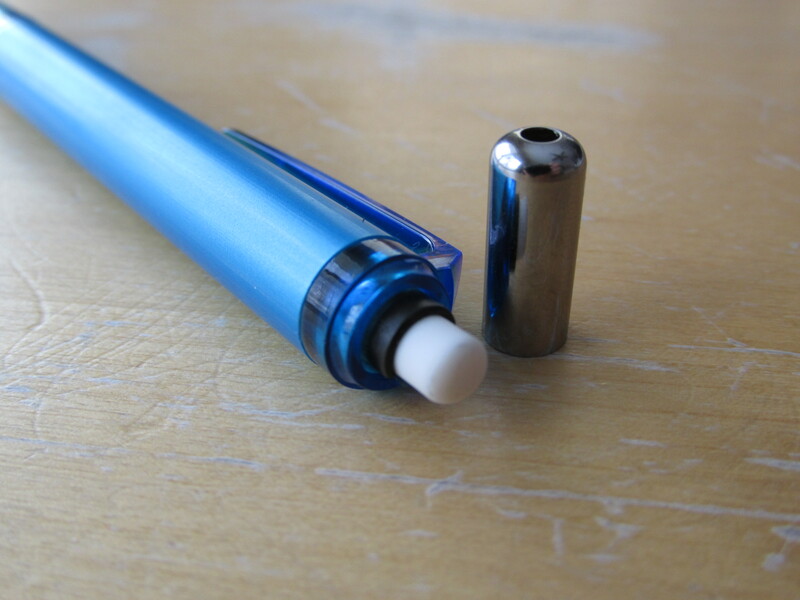 Importantly, the holder grips the eraser tight enough so that I will be able to extent it out as it gets shorter. As for erasing ability, it’s better than average. Let’s talk about the clip. 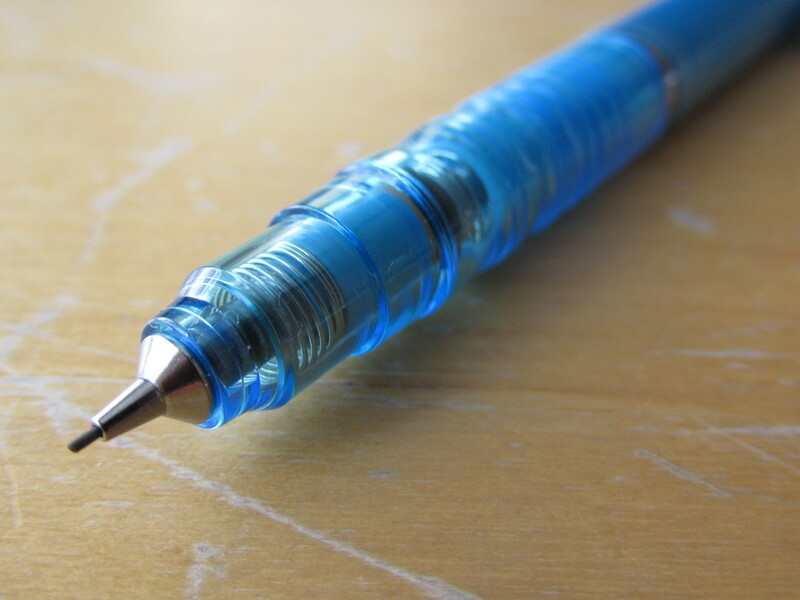 It’s plastic, offers minimal tension and will probably break before I lose the pencil. In other words, it is like most plastic clips on mechanical pencils. But, there is one very important and positive feature to the clip – it’s relatively short. 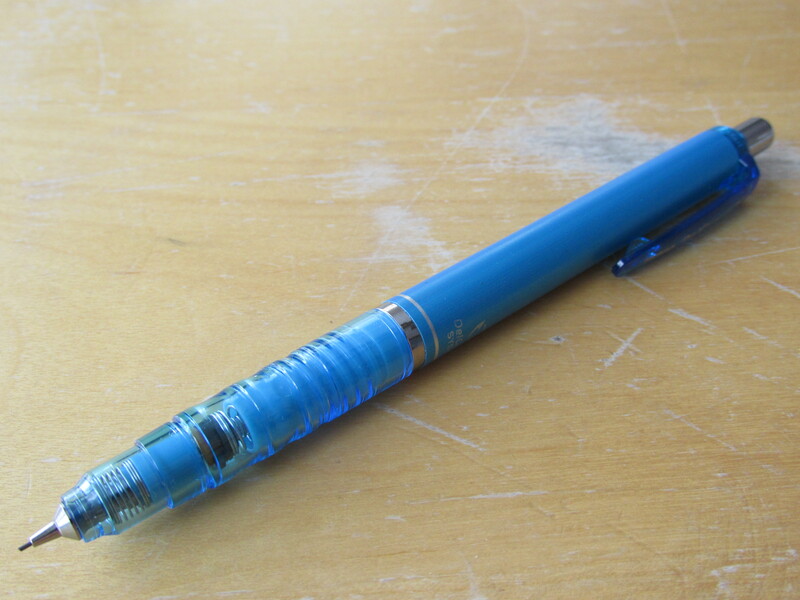 The one thing too many mechanical pencil makers do not understand is that it is important that the clip not interfere with the top of the hand as you write. Why is this important? Everyone slightly turns pencils (wood-cased or mechanical) in their grip as they write so as to find the sweet spot on the graphite. Yes, the Uni Kuru Toga solves this problem, but most people will turn their pencils just out of habit. 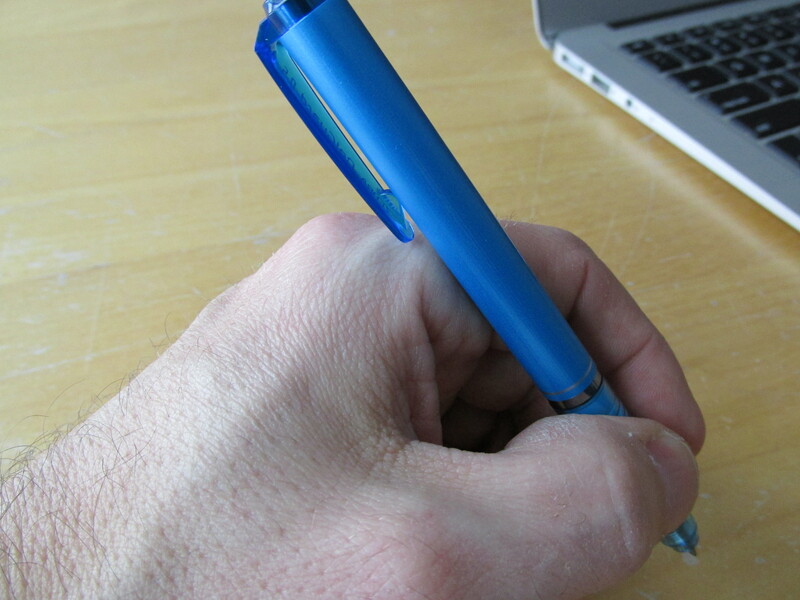 If the clip is too long, then you cannot turn the pencil a full 360 degrees without it annoyingly touching your hand. As you can see in the photo below, the clip just misses the top of my small but brutish left hook. How does the whole DelGuard thing actually work? Well, so far, perfectly. I have not broken off a piece of graphite once while using this pencil. Admittedly, I loaded it with F grade graphite but there has not been a hint of breakage. I strongly suspect HB and softer graphite would do very well in this pencil. To see the DelGuard in action, take a look at this overly biased video produced by Zebra. In summary, it looks pretty cool, the break-prevention clutch works as advertised, the clip stays out of the way and the eraser is serviceable. 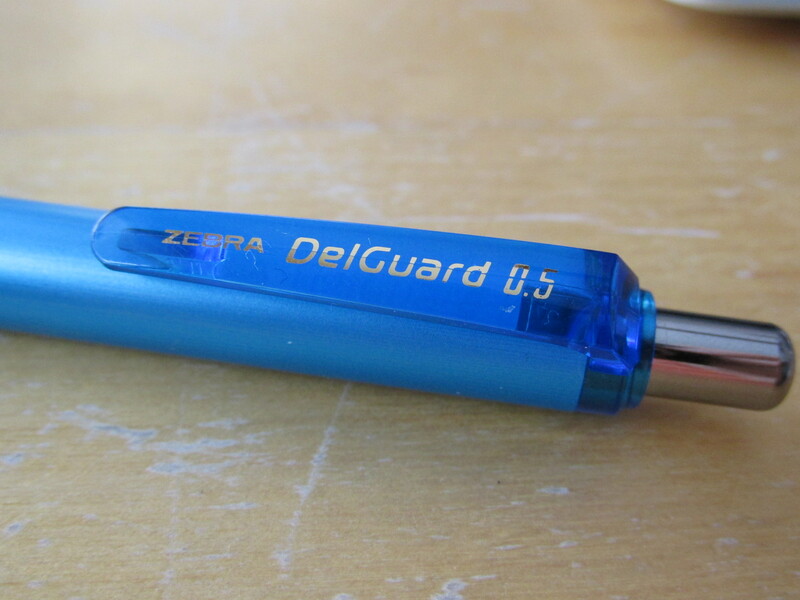 At a cost of $7-10, the Zebra DelGuard is moderately priced for a plastic mechanical pencil and may save you those few cents lost due to graphite breakage. Short of perfect but very much recommended.